Before you hire a new employee, it can be a good idea to conduct a thorough background check. Verifying past employment is an important first step in the background screening process. Doing so allows you to confirm that candidates you are considering provided accurate information about their work history and experience on their job application form or resume. 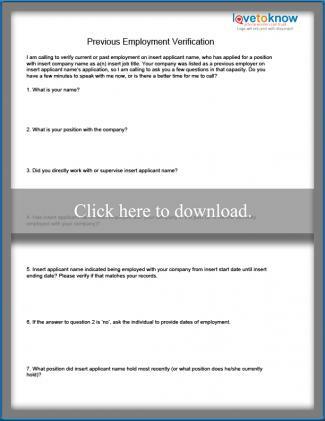 It also gives you an opportunity to ask previous employers questions about people you are considering for hire. The best way to verify the previous employment reported by job applicants is to call the companies listed on their job applications. Have a prepared list of questions ready to ask before calling. To access a printable list of example questions that you can edit, save and use, simply click the image in this section. Ask to speak to someone in human resources or a manager who can provide verification of past employment for an individual who has applied to work for your company. Start out by explaining who you are, why you are calling and who you are inquiring about. Ask specific verification questions first, keeping in mind that the company representative may not provide any information beyond confirming whether or not the person worked there and, if so, his or her dates of employment and job title. Once you have basic confirmation, probe a little further to see if they will also give you starting and final salary and whether or not the individual is considered eligible for rehire. If your contact is forthcoming with the information you have requested so far, also ask for any information about the individual's work performance, habits and other general reference checking questions. If a phone call is not practical, you may also request this type of information via email, though you will likely have to call the company first to find out who the request needs to be sent to and to get that person's email address. If you choose to do this, simply email the questions you would like to have answered in the body of an email, being sure to explain your purpose for asking. Keep in mind that you will not have an opportunity to probe for information beyond basic facts if you go this route. Some companies opt to outsource the process of verifying employment history instead of handling it in-house. The primary reason a company would opt to outsource this aspect of the screening process is to save time. Placing phone calls to previous employers can be time consuming, and this can be exacerbated having to leave messages, wait for callbacks and place follow up calls in addition to the actual phone conversations. If you are already working with a background screening vendor to pull criminal history data and other information that you may need, you can add employment history verification to your current package. Rates vary among vendors, though adding this service will typically add $10 to $15 per applicant to the overall cost. Depending on how busy your in-house HR team is, you may find that the cost is money well spent. When a third party is handling these calls, your staff may be better able to focus their efforts on tasks that could not easily be outsourced to improve efficiency and effectiveness when they are not spending time placing employment verification calls. However, if your team has time, there is no reason that you would have to outsource work history verification calls. Taking the time to verify employment history can help keep you from inadvertently hiring someone who doesn't actually have the experience claimed on the application. While it would be nice to be able to assume that people only provide truthful information, that just isn't necessarily the case. According to survey from CareerBuilder.com, more than half of candidates lie on their resume, with nearly one-third providing inaccurate employment dates and/or job descriptions and even more giving inflated wage information. The best way to avoid hiring someone who provides false information is to check the facts before making an offer.